Skyscrapers, high-rise apartments, neon signs and congested roads. These are a few things that might spring to mind when you think about a modern city. So what if you could start from scratch and try to create utopia? And what if one of the world’s leading architects designed the centre? 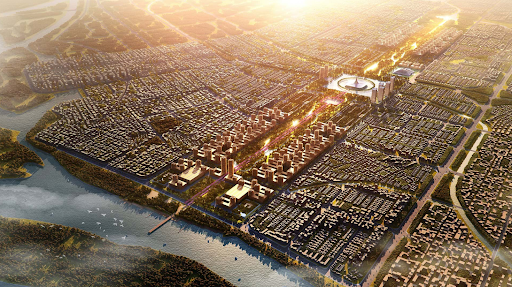 That’s happening in the Indian state of Andhra Pradesh, where the local government has enlisted Norman Foster to help redesign the capital city for the province, Amaravati. Singapore-based urban consultants Surbana Jurong are also involved in the planning, which aims to create jobs and homes for all, a world-class infrastructure, a green city and efficient resource management. Foster’s team is designing the central focus of the 217-square-km city, including the Legislature Assembly and High Court Complex, and according to the architect, the design will incorporate “decades-long research into sustainable cities” as well as the latest technologies being developed in India. This will become more important as the planet becomes increasingly urban, with around 70% of the world’s population forecast to live in cities by 2050. Sounds too positive. Only time will tell how sustainable this will be. Sustainable city with lots of green-based technology sounds a bit too good to be true.